In essence, the core of the problem is a fear of uncertainty. When the world becomes too complex for comfort, there’s a natural tendency to cling on to what we know, what we have, what we believe, and claim exclusive owner­ship of all such things. In short, the problem is one of possession – but in both senses, as both possessing and possessed. The first trap is that neither places nor ideas are commodities to be possessed: they simply are. And whilst a notion of stewardship does work as a model for ownership of such things, possession doesn’t: it gets in the way, all the time. The problem stems in part from a misuse of the Believer-mode – or, more specifically, a sub-mode of the Believer that we might describe as the Priest. 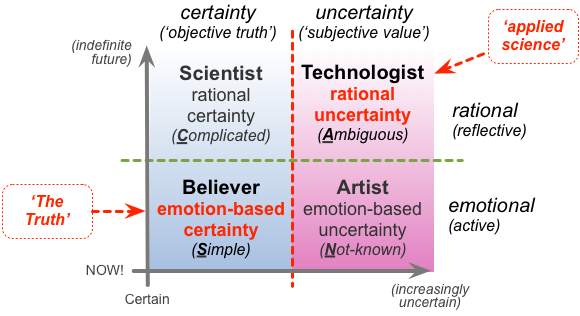 Like the Scientist, the Believer-mode needs certainty in the form of what it calls ‘truth’. But whilst the Scientist-mode gets there by testing and cross-linking everything to everything else, the Believer simply declares or assumes something to be ‘the truth’ – hence ‘to take it on faith’. To get round the problem that some things will inevitably not fit with that ‘truth’, the Believer-mode again simply declares that anything that doesn’t fit is ‘not-true’, and can or should or must ignored. It then places an explicit yet arbitrary boundary between the true and the not-true: hence, for example, that arbitrary separation between the ‘sacred’ and the ‘profane’ – literally ‘pro-fanum’, ‘that which is outside the temple’. There’s nothing wrong with that in itself – it’s a useful tactic for structuring relationships between things and activities and responsibilities, as we’ll have seen in every organisation. The problem comes when people think that the boundary is real, that the boundary is itself an integral ‘The Truth’ – and try to possess everything inside it. The Priest sub-mode of the Believer not only tries to possess the belief, yet also tries to possess others’ beliefs too, by forcing others to believe likewise – the classic Bolshevist tactic, for example. (The ‘must-be mistake’ that we saw in Sin #4 can likewise be a problem here, because it’s often also an attempt to claim a Priest-like possession of ‘the only truth’. For example, for members of the Skeptics Society – which, to be blunt, is often little more than a cult-like religion based on scientism – it’s not unusual to claim that if they can reproduce some supposed ‘supernatural’ event by illusionist means, then that must be the way it was done. They appear to believe that this gives them an inalienable right to harass and ‘expose’ all others as purported frauds. We’ve seen some of this already in the Newage Nuisance and Golden-Age Game, of course, but what makes it even messier here is the creation of boundaries that are put up to protect the ‘possession’. Reality as a whole doesn’t have boundaries: pollution takes no notice of national borders, for example. And as enterprise-architects it’s not just the fences and walls around the organisational silos and suchlike that get in our way – it’s the arbitrary separation of things that’s the real problem, because it prevents us from gaining any sense of the whole. To give an archaeological example, consider large-scale archaeoastronomy (NASA summary [PDF]) at a site such as the Castlerigg stone circle in northwest England. The circle itself is the bit that everyone sees, as the supposed ‘sacred site’. Yet it’s also a kind of local focus – the foresight, so to speak – for a meshwork of sight-lines that could be to identify specific rise and set of sun and moon and stars, as per that respective astronomical epoch of several thousand years ago. But the other ends of each of the lines – the backsights – are the peaks and notches in the mountains all round the circle, miles away into the distance. The central ‘sacred site’ makes no sense unless we consider the entire landscape – circles, hills, valleys, mountains, everything – to be part of the site as a whole. So although it’s true that there are places that act as focal-points in some sense or other, there are no ‘sacred sites’ as such – everywhere is ‘sacred’ to someone, in some context. 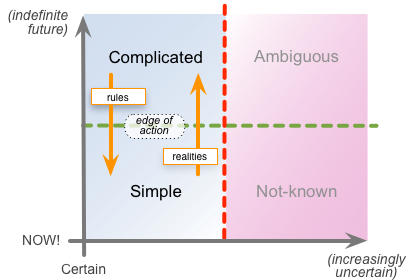 It’s all one continuum: creating arbitrary boundaries between the ‘sacred’ and the ‘pro­fane’, the ‘important’ and the ‘unimportant’, will just get in the way, not only of action, but of thinking, too. For enterprise-architects, the same principle applies to the relationships between organisation and enterprise, to the relationships beyond the organisation, to any ‘enterprise of enterprises’ and so on. That’s one reason why I’m so emphatic in warning against the dangers of any form of ‘something-centrism‘ – whether it be IT-centrism, organisation-centrism, money-centrism, customer-centrism, shareholder-centrism or whatever. In much the same sense, fixed ideas or theories about the past or future can themselves become boundaries to our thinking, preventing us from seeing a context in any other way. ‘The past’ is subjective, not objective: we can’t go there, and there’s very little that we can test in the Scientist sense – we have no way to tell for certain what people thought, how they felt, what they believed. The exact same applies to any notions of ‘the future’: by the time we get there, to have anything that we can test in an objective sense, it’s not longer ‘the future’ – it’s the present. In a very literal sense, both past and future alike are “a different country”: they did and will indeed do things differently there, and often for very different reasons than those that would apply in the present time. There’s also an academic discipline called ‘deconstruction‘ that can be useful here. Its task is to pick apart each assertion of ‘truth’, so as to surface any hidden assumptions. More useful still is an expanded variant called Causal Layered Analysis which applies the same question­ing up and down the layers, from the everyday ‘litany of com­plaint’ down to the deep myths and core-beliefs. The aim in both cases is to identify notions and worldviews that are somehow ‘privileged’ – assumed to be fact, but without any actual questioning to verify it as fact. (One catch to watch here is that the same deconstruction must always be applied to the analysis itself, to check for our own hidden assumptions in the way we do it. Kind of mind-bending in its recursion, perhaps, and often personally challenging, too, but it’s something that must be done if the analysis is to be meaningful. If we avoid this check, our own worldview becomes ‘privileged’ – presented as indubitable ‘fact’, in the classic Possession Problem style – but we have no way to recognise that we’ve done so. The result is usually some pointless exercise in arrogant ‘Other-blame’, with nothing useful that can be achieved at the end of it. It then becomes useful – if sometimes embarrassing – to ask what worldviews and assumptions tend to be ‘privileged’ in in or our work-domains, enterprise-architecture and the like. The Golden-Age Game is one obvious example, but there are plenty of others – such as the tendency to regard anything supposedly ‘IT-based’ as inherently better than anything else. Or likewise the Taylorist assertion that managers and management are inherently ‘more important’ than any other aspect of organisation – which turns out to be just plain wrong. So another potent source for the Possession Problem is that, in part because of the nature of the Believer-mode, and under pressure from their respective Priest-mode, each group and enclave will tend to create, and enforce, its own orthodoxy, its own ‘official version’ of ‘the truth’ – frequently deriding anything and anyone else as ‘the lunatic fringe’. Archaeology has a long history of this, for example; likewise medicine, in fact pretty much every discipline with a strong inherently-subjective base. Which, yes, does include enterprise-architecture – especially at larger scope or scale. What’s interesting, too, is the process by which yesterday’s ‘heresy’ so often becomes today’s orthodoxy, and onward to tomorrow’s passé ‘prim­itive beliefs’. As Thomas Kuhn showed in The Structure of Scientific Revolutions, it’s something of a truism that science will progress mainly by the death of senior scientists – especially those who’ve had a huge personal investment in some particular theory, and will permit change only ‘over my dead body’, in an all too literal sense… In other words, the Possession Problem again. The best way round this, perhaps, is to take the long view: ‘truth’ changes over time, but quality is real, and lasts forever. 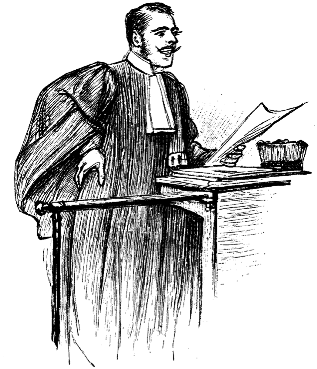 And if anyone tells you they own ‘the truth’ about anything, be wary: it’s almost certainly a problem of possession. The sub-mode we’re most concerned about here is the Priest. (You’ll find more detail on the other sub-modes in the post ‘Sensemaking and the swamp-metaphor‘.) In essence, the Priest-mode is a Believer that, if it’s not careful, can delude itself into thinking that it’s a Scientist – in other words, mistake its Believer-mode subjective-‘truth’ for a Scientist-mode objective-‘truth’. To explain why this is so problematic, we need to look a little deeper at how those sensemaking modes work in relation to each other. 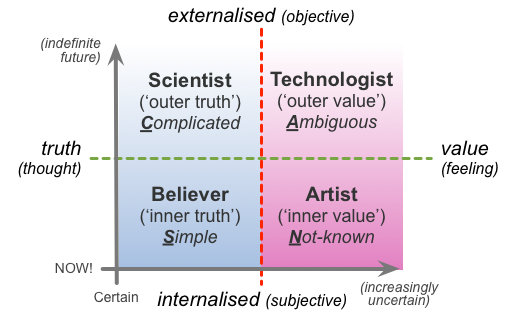 In our crossmap, the edge-of-action also maps to the edge between Scientist and Believer respectively. 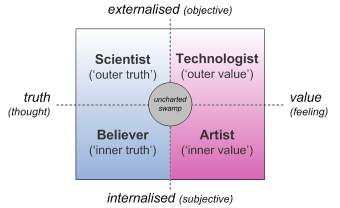 Which, following the swamp-metaphor, means that the Scientist-mode will work on rules for the Believer-mode to use; and the Believer-mode will pass back to the Scientist-mode its experiences, so that the rules can be revised as necessary. 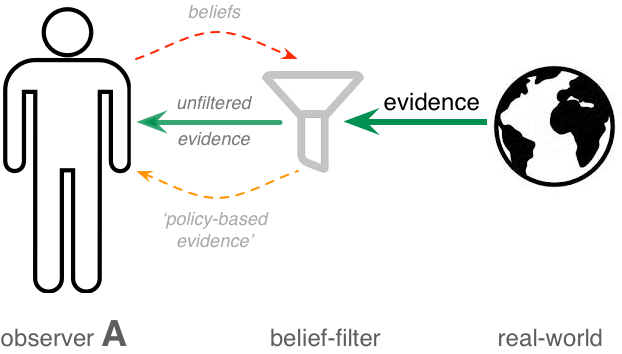 …except that instead of real-world evidence, the filtering is applied to the rules and guidance coming ‘down’ from the Scientist-mode. And yes, it’s worse than it appears (to quote Dave Winer). The Priest-mode sits right up against the most extreme edge of certainty – it’s driven by certainty, and actively rejects anything else. 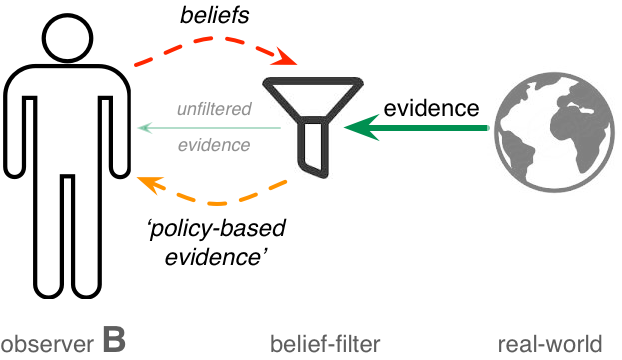 But because it’s the Believer-mode analogue of the Scientist-mode, and the Scientist-mode’s normal role in the sensemaking / decision-making / action loop is to develop and pass rules to the Believer for action, the dysfunctional Priest-mode is an extreme-certainty Believer that is also certain that it has the ‘right’ to impose its beliefs on others. And – because it’s so certain that it’s right – it’s also certain that it has the ‘right’ to ignore any real-world evidence coming from elsewhere in the Believer-mode, or anywhere else at all. 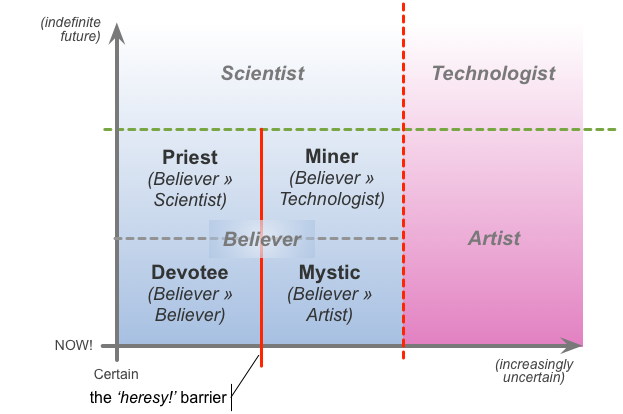 This is a key part of what drives the ‘heresy!’-barrier, and why it’s so difficult to break. The other key driver towards getting locked in the Priest-mode is over-investment of ego in a belief. The danger there is that any doubting of the belief, or its validity, is no longer interpreted just as straightforward critique, a metaphoric ‘threat’ to the belief – instead, it may be interpreted as an existential threat to Self. Hence, again, the ‘heresy!’-barrier – but also a high risk of abuse or violence, to others, or even to Self. From the outside, the Possession Problem might look relatively minor – in fact in most cultures now it’s so much regarded as the norm that it’s almost considered praiseworthy in itself. The reality, though, is that in practice the Possession Problem is one of the most destructive sensemaking ‘sins’ we could fall into – and dangerous not just to ourselves, but often even more so to others as well. As enterprise-architects, we need to be extremely wary of it – perhaps especially in ourselves. Yet another You Have Been Warned item of which we need to take note, perhaps? Let’s move on, anyway – and next on the stack is Sin #6, the often somewhat-strange Reality Risk.